Annan once again romp to a 2 goal interval lead but Clyde hit back and in a devastating 12 minute spell score three goals to leave Annan stunned and chasing the game, calling for Annan’s goal machine Peter Weatherson, making a comeback from injury, to step up and score a stunning 25 yard free kick to salvage a deserved point for Annan in the 85th minute. Yes it was a six goal thriller and neither team did enough to lift maximum points but here we are on the final straight and the league title race can be likened to a horse race with 10 furlongs to go ( 10 games ) and there are six runners all heading for the final post and all with a chance of crossing the finishing line and with no thorough bread in the field the big question is who will win the race to the finishing line. Annan’s place in the final straight will be determined by their next four matches when they play table topping East Fife next Saturday followed by Queens Park at Hampden mid week, Berwick at Annan and then Clyde mid week, by the completion of this round of fixtures it should all become a bit clearer. Clyde started promisingly when Sean Higgin’s shot in the 5th minute went narrowly over the bar as Annan were being forced to defend in this opening spell. 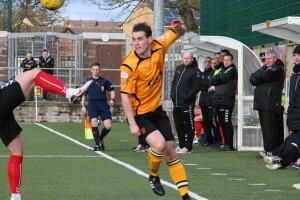 In the 16th minute Scott Durie’s cross found Scott Linton’s head and the effort went narrowly past the post. Annan forced their first corner in the 20th minute and minutes later McStay released Flynn down the right but Walters averted the potential danger intercepting Flynn’s cross. Annan opened the scoring in the 24th minute when Josh Todd picked up a Martin McNiff’s penetrating through ball and Todd turned Mark McLaughlin on the edge of the box to finish with a superb low shot into the corner of the net and past the outstretched arms of keeper Marc Waters. Minutes later at the other end of the park Scott Linton’s cross was headed narrowly past the post by Sean Higgins. Annan’s Josh Todd then struck again in the 31st minute, the opening for the goal however was down to a determined interception by Ben Jago who won the ball on the half way line and his pass into the path of Todd was perfection and the Annan striker once again finished clinically with a low shot into the corner of the net to give Annan a 2 goal cushion. Ross Millen received what turned out to be the only yellow of the match in the 43rd minute for a rash challenge on Rabin Omar. Currie made a confident save low down to deny Scott Linton in the 43rd minute as Clyde pressed for an opening. Clyde made a promising start to the second half but the Annan defence withstood the early onslaught and in the 49th minute Annan had a good shout for a penalty turned down as Lewis Guy appeared to be taken out by Chris Smith. It was a fortunate break for Clyde who were pushing and it took an important interception by Nicoll to deny Clyde a clear scoring opportunity. Annan created a clear chance in the 55th minute when Guy and Flynn combined to set up Todd but the final shot was poor and did not ask enough of keeper Walters. At the other end McLaughlin set up Sean Higgins who’s effort went narrowly past the post. Sean Higgins set Clyde on the road to recovery when he pulled a goal back for the Bully Wee in the 60th minute with a well timed header rising above McStay and Jago to guide the ball into the top corner of the net. It sparked the start of a glorious period for the visitors and in the 67th minute Scott McLaughlin squared the match when his low shot from 10 yards following an untidy clearance had the Clyde fans in raptures. All of a sudden Clyde were on the ascendancy and Annan were being put to the sword and in the 72nd minute Annan were chasing the match. The goal however was down to an error by Annan’s Kevin Nicoll when he was forced to defend going back to his own goal and the Annan defender slipped under pressure and lost control 6 yards out and the half cleared shot was smartly despatched into the net by Higgins from close range. The 12 minute spell saw Clyde turn the match on its head leaving Annan chasing a game they appeared to be in control of. Annan brought on substitute Jordan Moffat for Matty Flynn closely followed by Peter Weatherson for Ryan McStay in the 80th minute and it was Weatherson who had the final say on this match when he marked his return following a six week lay off. Todd was once again involved winning a free kick after being pulled back 25 yards out and Weatherson eyed the situation up before finishing with a stunning free kick which flew past the Clyde wall and Marc Waters right hand side and into the corner of the net. It was a fitting end to a game neither team deserved to lose but again Annan will look back on this game with some regret knowing that the point gained may not be enough to guarantee even a play off place. Annan’s biggest challenge is to stop leaking goals it has plagued them all season while at the other end of the park they are the leagues top scorers. East Fife and Elgin are the teams who are currently with the points on the board and they are the teams that the rest are chasing, Annan travel to Methil next Saturday to face the league leaders where nothing less than a victory is essential for Annan if they are to have any title aspirations. ANNAN ATHLETIC: Blair Currie, Ben Jago, Kevin Nicoll, Martin McNiff, Peter Watson, Ryan McStay ( Peter Weatherson 80 min), Steven Sloan (Greig Macdonald 85 min), Matty Flynn (Jordan Morton 71 min), Lewis Guy, Josh Todd, Rabin Omar, SUBS NOT USED: Jordan Hart, Stuart McColm, Scott Norman, Steven Black..
CLYDE : Marc Waters, Scott Durie, Scott Linton, Mark McLaughlin, Chris Smith, Scott McLaughlin, Ross Millen, John Paul McGovern , David Marsh, Sean Higgins, Marvin Andrews(Michael Bolochowecky 80 min), SUBS NOT USED: John Gibson, GK, Steven Brisbane, Reece Glakin, Jamie Watson, Paul Slane. REFEREE: Euan Anderson, Assistants Lloyd Wilson and Matthew MacDermid.